May a strike be with you Image Jennifer D.
Way before we had picked our birthday party theme, my son had been snacking on Gerber Graduates Puffs . While he loves these, I was dismayed because the containers were not recyclable. So, I had been saving them trying to think of a use for them. Once the label was peeled off, the container reminded me of a person’s shape. 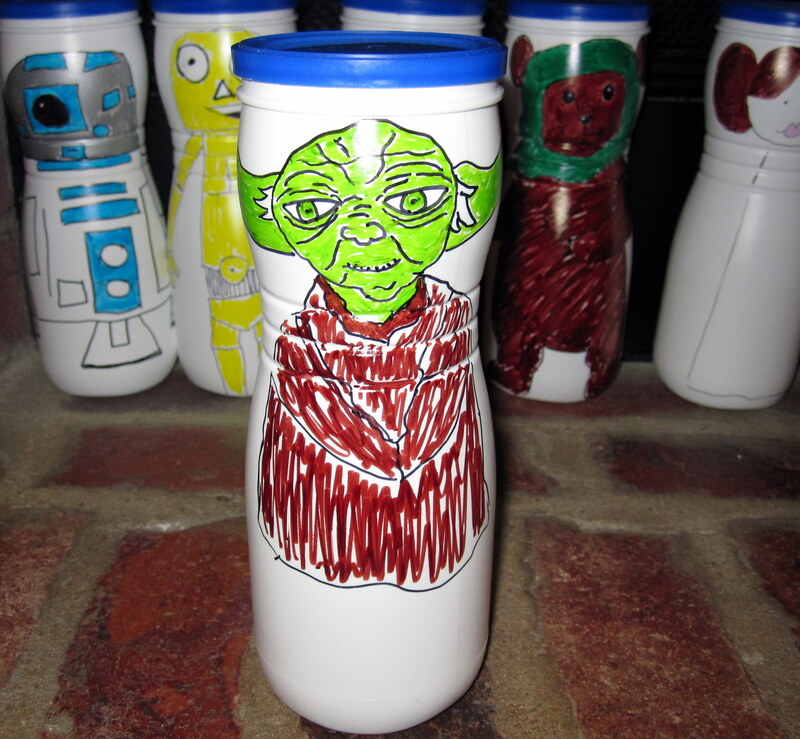 It was then that inspiration struck and I set about making baby food containers into a set of Star Wars bowling pins. 10 puffs containers, washed out with lids. You can find the Gerber ones anywhere and Target sells their brand too. They are basically the same shape. Good quality images of the characters you want. I found several random images that I attempted to draw via Google and the very talented Katie Cook was inspirational as well. 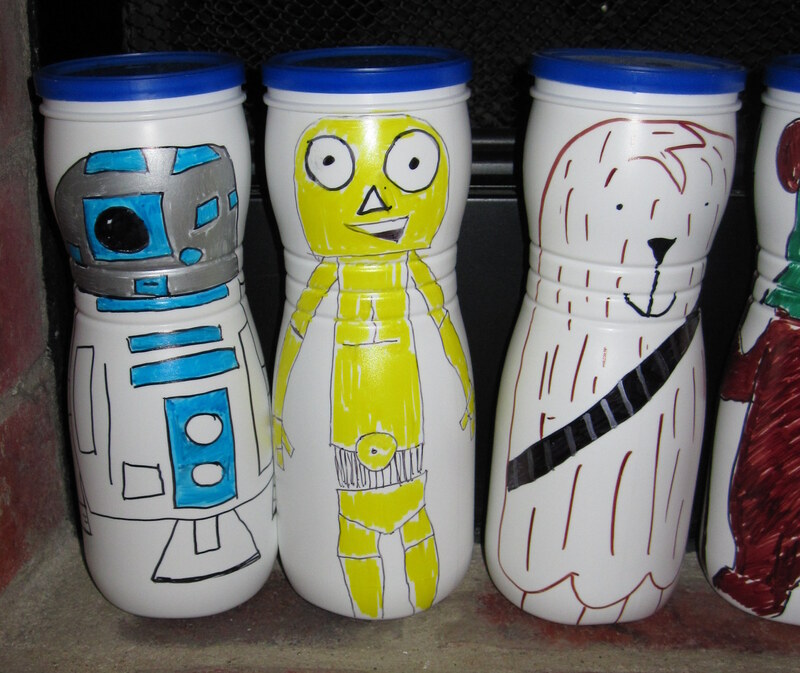 If you can’t tell by that scary C3PO above, I am not an artist (seriously, he looks like he is psycho or something) but I found images of Star Wars characters that I thought would be easy enough to draw free hand onto the bottles. Then I took my time and did the best I could, reminding myself that this is for a kid’s birthday party and they didn’t need to be perfect. If you make a mistake, the marker does not come all the way off. Hence the unfortunate moob on the stormtrooper. It does, however, rub off some so you have to be careful that you don’t accidentally smudge it off while completing your drawing. Also, the darker colors tend to smear into the lighter colors. You are really only limited by your imagination and,of course, your drawing skills, but these would work for just about any party theme. My favorites are Yoda and Jaba the Hutt. Which ones do you like? 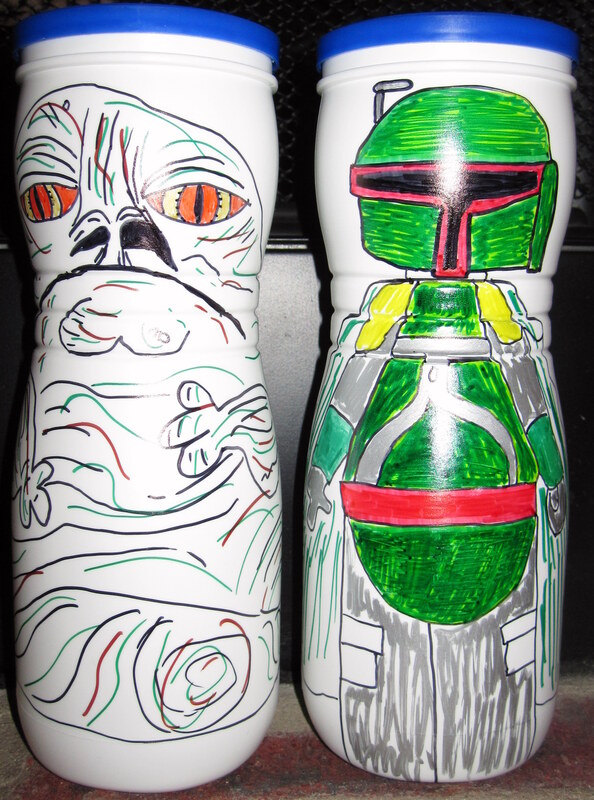 Jabba and Boba Fett Image Jennifer D.
NICE job! I’m so impressed! I would have no idea how to draw Jaba the Hutt. Really cute idea!